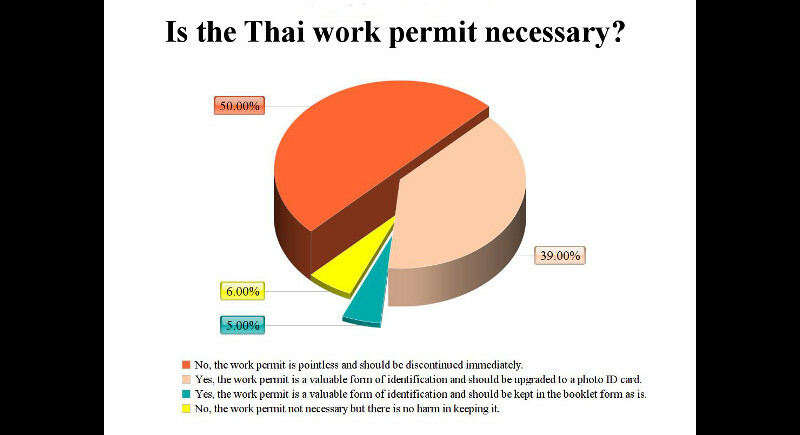 PHUKET: Opinion on whether or not to keep work permits is divided, with those calling for Thailand’s “little blue book” to be discontinued edging ahead, according to the results of a recent online poll by The Phuket News. That question was prompted by the news last month that a work permit is not required in order to receive income from renting out a condo, an announcement that brought much relief to expat condo owners across the island. However, the disparity of that decision (see story here) compared with the need for a work permit for any other income-creating activities by foreigners threw the proverbial cat amongst the pigeons in a country where work permits are required by any foreigner even doing free volunteer work. For decades the concept of whether or not money is received has been irrelevant as the definition of work in Thailand remains “engaging in work by exerting energy or using knowledge whether or not in consideration of wages or other benefits” (see Ministry of Labour website here). To see the poll results, click here. To see the results of our previous poll, which asked, “Should the United Kingdom remain a member of the European Union or leave the European Union?” click here. To suggest a poll, email execeditor@classactmedia.co.th with “Poll Suggestion” in the Subject line. @ Asterix, ...Silly Joe12. More and more he doesn't understand peoples comment, at least not respect it. Just like to put down people. Sad for him, amusing for readers as Joe12 reads all my comments, and comment on them!! Sitting in his fish bowl. So, he lies when he say not take any notice of my comments. And the list of jobs reserved for thai is not that long. Asterix...still don't understand the point of your comment. A lot of jobs are reserved for Thais only. Sorry I don't take any notice of Kurt's comments because they are wrong anyway or way off the planet. @ Asterix,  Many live aboard boats( 4-5 day trips) to Similans have foreign dive instructors who during these trips work as dive master. My comment is not racistic. I leave it up to you, saying that Thais are not xenophobic. I not recognise myself in that part of your reaction. It is totally not about that. Yes I am correct... It had been confirmed by TAT Registration Office many times through media and at professional meetings about tourism and safety by the sea. DIVEMASTER: Only Thai Divemasters may be dive guides to guide divers, Thais and foreigners, during fun dives. Scuba Dive master is different from being a scuba dive instructor. Not many thai have the stamina to go through all this dive education/training, besides the fact that many thai believe that below the surface are bad spirits. Asterix...First you say, "jobs are reserved to Thais only...forbidden by Thai Labour Laws". Then you state "...are able to teach dive courses only" Which is it - you can or can't work? So....Technically;  If one helps the elderly lady who dropped her groceries one could get five years in jail or a fine of B2,000 to B100,000, or both? One is not even allowed to help another who is struggling to figure something out. If this is so, I hope the work permit is abandoned. People should not be fined and/or jailed for helping others. Mhh, I have been doing life aboard with several foreign dive companies to the Similans, with foreign dive masters. Their dive equipment was up to date according international PADI regulations, something we can not always say about thai dive companies, as they not that often clean the their air compressors, so you inhale dirty air during diving. In Thailand, Divemaster jobs are reserved to Thais only and all foreign Instructors are forbidden by "Thai Labour Laws" to divemastering divers' groups and are able to teach dive courses only (Nature of work/Title/Occupation/Profession/Condition) on premise (Address of place of work) and the province (Permitted locality of work) written in their work-permits.